Actually it is because I didn't have pasta on hand that day, so I used korean wheat noodles. Surprisingly, it turned really good. But well this will work really well with pasta, especially angel hair pasta. I like it to be spicy, so I added bird's eye chili. 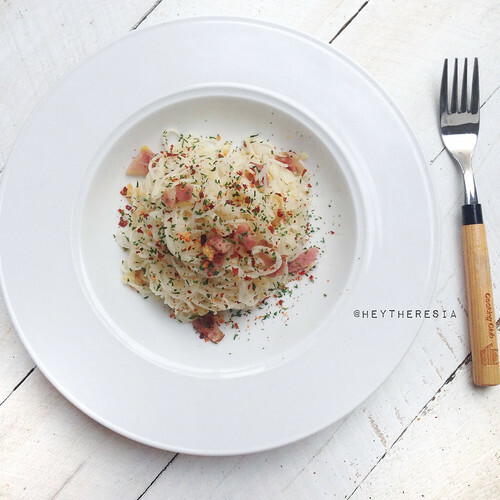 My sister said it was good, she likes it better aglio olio with thin korean wheat noodle than pasta. 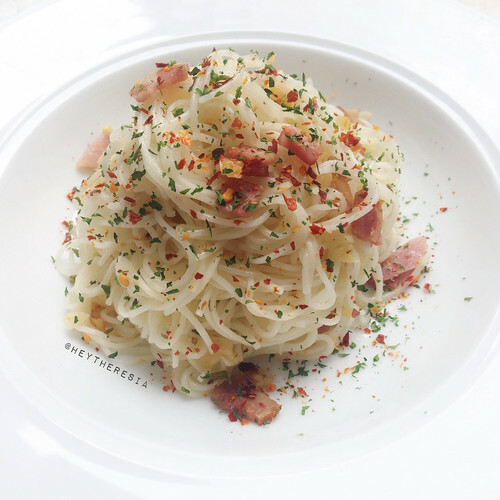 I like both with thin noodle or pasta especially angel hair, but I prefer mine without bacon or any meat. My favorite is with bird's eye chili and basil. Cook the noodles following the packaging instruction. Drain the pasta, and save a little amount of the noodle cooking water. Saute the garlic and bacon with olive oil, add the chili, salt, and herbs, add a little noodle cooking water. Toss the noodles.